We’d love your help. Let us know what’s wrong with this preview of Cataclysm by David Stevenson. To ask other readers questions about Cataclysm, please sign up. I readily confess I am a B.H. Liddell Hart addict, and adore his writing on WW1. Are there any other Liddell Hart fans out there who have read both and will this compliment my knowledge or does it mirror what Ive already read? Very specific question, sorry. As a history lover, one of the better topical choices I ever made was to dive into the saga of the First World War. Once it was a subject that seemed so impossibly complicated, that I hesitated to even try. Besides, why should I care about World War I when I had World War II to study ad infinitum? I probably read one hundred books devoted solely to the Nazis before I finally picked up a book on 1914. Of course, once I did, I found myself hooked. The First World War is complicated. Its origin is practically byzantine, and requires careful attention. But after you start to get the hang of things, you realize how incredibly consequential it was, and continues to be. (Aside: You might be wondering, did I read War and Peace solely to casually drop it into other book reviews? The answer is a resounding yes). David Stevenson’s Cataclysm is a comprehensive overview of the First World War. It is divided into four sections: the first is on the outbreak of war, especially the July Crisis and the “war of movement” ending on the Marne; the second covers the escalation of the war from 1915-17; the third is devoted to the war’s endgame in 1917-1918, including Ludendorff’s last gasp offensive, and the Allied riposte; and finally, the fourth section takes us all the way from Versailles to the end of World War II, discussing the First World War’s impact and legacy. As its subtitle suggest, however, Cataclysm is not interested in a straight chronological retelling of battles and tactics. This is most assuredly not a military history. With very few exceptions, the ebb and flow of particular clashes are ignored completely. Most of the time, Stevenson mentions battles only to derive an overall conclusion about their impact. Instead, Cataclysm is more of an analytical text, discussing how the war began, why the war was fought, why it kept going, and what it all meant. Cataclysm is carefully organized, almost to the extent that it reads like a dissertation. Stevenson will say he has three points to make, he’ll summarize them, he’ll discuss them, and then he’ll give you his conclusion. He uses a couple different approaches as well. Sections one and three are told thematically, meaning he will raise an issue and then discuss from the perspective of each of the Allied and Central Powers. Sections two and four, on the other hand, are delivered chronologically. At its best, Cataclysm answered things I didn't know, re-contextualized things I did know, and played a low-key devil’s advocate as to certain received wisdom. For instance, the trench has long symbolized the horror and futility of World War I. It is hard to imagine how men could endure them, how they could (with few exceptions, like the French mutiny) voluntarily keep going. Stevenson turns this on its head. In his telling, trenches made the war’s continuance possible. As he explains, the periods of movement and maneuver, such as the Germans attacking through Belgium and the French lunging towards Alsace-Lorraine, were proportionately the deadliest periods. The trench, as it was intended, protected the combatants. Sure, they were hellish, filled with rats and water and bones, but they also lowered casualties and made things survivable, if only just tolerable. Stevenson’s discussion on war aims is especially important. Having read the excellent Ring of Steel, by Alexander Watson, I already had a good idea of the goals of Germany and Austria-Hungary in continuing the conflict. (Stevenson rightly points out that these aims were not the casus belli, but arose after war began). Here, Stevenson covers the war aims of all the belligerents. By examining these nationalistic wish lists, you start to see why the fighting didn't simply stop. Despite the casualties, each nation had a reason to see things through to ultimate victory. The most famous wartime literature, such as Remarque’s All Quiet on the Western Front, show the war as hideous folly. Yet as Stevenson demonstrates, the majority of the soldiers kept going. Governments and high commands creates the circumstances in which thousands of troops with merciless weaponry were obliged to kill and maim, but they could not determine the speed and scale of the carnage. This being the case…even more depended than in previous wars on the individuals’ combat motivation. And it remains true…that from the Marne and Tannenberg to the Somme and the Chemin des Dames citizens soldiers did kill each other, often at rates of several thousand a day for weeks at a stretch. Stevenson goes on to list the factors that made this possible, such as improving basic living conditions (e.g., troop rotations, assignments in quiet sectors, even newspaper delivery), coercion (obviously), group dynamics (including the creation of “elite units” of motivated troops), and ideological factors (e.g., patriotism and nationalism). All this adds up, Stevenson concludes, to a soldiery that, by and large, believed in the war and was willing to see it through. Now I come to the point where I have to admit that this book exhausted me. I carried it around for weeks in order to finish it. I actually feel a good deal of relief that it’s done. At 488 pages of text, this isn’t exactly War and Peace (which, as you recall from above, I have read), but it feels much longer. For one, my paperback version is the size of a brick, with large pages, exceptionally small font, and incredibly long paragraphs (I estimate an average of 1.5 paragraphs per page). I don’t know if these conditions apply to different editions; still, it made it hard to read. Mostly, though, this is a dense and serious treatise. Stevenson, in discussing the war, likes to use the phrase “force-to-space” ratio. Taking his cue, I would like to propose the information-to-respite ratio, measuring a book’s scholarly intensity. Cataclysm is very much an academic versus popular history. It is a mostly-undiluted knowledge dump. Yes, it is systematic, clearly organized, and well laid out. But it is not entertaining. There are many ways to make learning palatable. In a book like this, you can use narrative set pieces (think Tuchman’s opening paragraph in The Guns of August), memorable biographical sketches (think Tuchman again, or Margaret Macmillan’s The War that Ended Peace), or the personal reminisces of the soldiers who actually lived through the experience. Stevenson does not use any of these tactics. The result can be a slog. I don’t know about you, but I agree with Mary Poppins that a spoonful of sugar helps the medicine go down. Here, the sugar is lively writing, and the medicine is knowledge. To date, "Cataclysm" is probably the best single-volume history of World War I available. David Stevenson avoids being bogged down by minutiae presented in chronological order. He opts for painting the big picture in great detail, using succint prose as his brush. The demands of military history require Stevenson to present the war as it happened in the opening moves of 1914 But he skips past the stasis of the middle period to resume the thread of events in spring, 1917. Other authors succumb to To date, "Cataclysm" is probably the best single-volume history of World War I available. David Stevenson avoids being bogged down by minutiae presented in chronological order. He opts for painting the big picture in great detail, using succint prose as his brush. The demands of military history require Stevenson to present the war as it happened in the opening moves of 1914 But he skips past the stasis of the middle period to resume the thread of events in spring, 1917. Other authors succumb to the need to present the war's middle period in all its great, bloody dullness. Here Stevenson opts out, using the shift to total war to examine broader themes in strategy, tactics, arms production, manpower, diplomacy, politics and diplomacy. Gone are the cliches about World War I. The armies are not sheep being led to the slaughter, but forces locked in unending siege warfare. How to break the deadlock? New technology? New tactics? New strategy? The leaders and generals desperately seek a solution that will yield victory, as heavy losses to date would be sacrificed for nought if one side sought peace, something the led could not tolerate from their leaders. WWI made exceptional demands in the realm of grand strategy. National resources had to be organized, harnessed and focused on war fighting. This required a degree of technocratic competence that 19th century statecraft and military practice could not provide. Stevenson explains all this in good detail, keeping the story going without getting bogged down. Political analysis of the First World War, and how the political elites had willingly acted in favor of war, and made the bloody mess continue. I defer to Margaret MacMillan's review here. Lo que nos cuenta. Aproximación a la Primera Guerra Mundial que trata de explicar las razones de su comienzo, las del aumento de las hostilidades y su recrudecimiento, las de su final y las consecuencias de la misma, haciendo hincapié en que no fue un conflicto de naturaleza “menor” que se fue escapando de las manos y sí un enfrentamiento de voluntades respaldado por razones conscientes y decisiones meditadas por más que fuesen equivocadas (y con mayoritario apoyo popular, al menos en su comienzo). 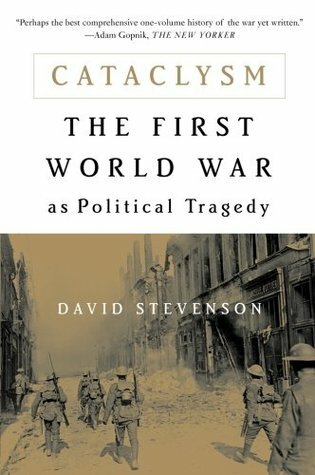 David Stevenson's Cataclysm: The First World War as Political Tragedy may be the best coverage of the First World War ever written. This terse, detail filled tome covers, in incredible detail, the political, financial, logistical, and strategic decisions and challenges faced by all of the belligerents. When I was in middle school, our coverage of World War I started with a class exercise. We broke into groups, were given a written description of our groups’ thoughts (basically- ‘You have an agre David Stevenson's Cataclysm: The First World War as Political Tragedy may be the best coverage of the First World War ever written. This terse, detail filled tome covers, in incredible detail, the political, financial, logistical, and strategic decisions and challenges faced by all of the belligerents. When I was in middle school, our coverage of World War I started with a class exercise. We broke into groups, were given a written description of our groups’ thoughts (basically- ‘You have an agreement with so and so group to fight a war if they join one, but here’s why you might not want to’), and a group was told that one of their leaders was assassinated. Soon, the entire class was at war. The goal was to show that politicians weren’t so much in control of this war- events just spiraled out of their control, and the result was a conflict resulting in millions of deaths and effects which are still felt today. Cataclysm challenges that view- it shows, in great detail that politicians deliberately made choices to both initiate the war, and continue it despite appalling casualties. Most importantly, it presents this case in an unbiased fashion as possible- you won’t find much in the way of assigning blame to one country or group in here. The book is broken into four major parts, and I feel it’s probably handy to at least mention them for and understanding of this book’s value. In Part One, Outbreak, Stevenson examines the causes of the war- from the decisions taken by politicians after the assassination of Archduke Franz Ferdinand of Austria and his wife to the various diplomatic factors faced by Germany and Austria prior to this event, to the tensions caused by the Balkan Wars, to a bunch of other things. I feel this is probably one of the strongest sections of the book- the causes of World War I are one of the most studied topics in history because there are SO MANY factors that went into it. This book does a fantastic job covering them all. The central theme is, of course, that World War I was a controlled event- the politicians from BOTH sides knew (at least partially) what their actions would cause, and chose them anyway. The first part ends with coverage of the initial attacks in the first year, and the difficulties faced on the Eastern and Western fronts- including why the front lines didn’t advance on West for 4 years, and the ones in the East didn’t move very far to start. It also describes why the Germans chose to keep their fleets at port, instead of going out to attack the various British troopships when they were vulnerable (since the British fleets at Scapa Flow probably couldn’t have arrived in time). The desire to not risk the fleet, keeping it as a ‘political instrument’ would of course present the Germans with problems later- Stevenson shows us early on the decisions made by the Central Powers that ended up hurting them. Part Two, Escalation, nominally covers the middle of the war- from spring of 1915 to spring of 1917. As we know, there were several major battles during this period- Verdun, Somme, and Cambrai, for instance are all well known. Despite this, the advancements of defensive warfare meant that no advances were made, so in the long run, there isn’t a lot of historical interest that happened (‘escalation and stalemate, both sides applying rising levels of violence yet failing to terminate the impasse’ according to the book). However, instead of boring the reader with page after page of inaction, Stevenson chooses to examine the issues that kept the war going as well as examining, by country, the various issues facing them, from manpower shortages, to morale, to economics, and into new logistical, tactical, and technological advances. He does a great job blending the information in- although the information is fairly terse at times, the information is presented in a way that shows, at each step, how it influenced the course of the war. One thing to note about this section is that coverage of the war is only briefly chronological- much of the section is devoted to discussions about the various topics and how they influenced later parts of the war- not so much when they happened during it. Also covered in this section are the war aims of the various countries. The people of a country won’t support a war without knowing why they’re fighting, after all. Some of the works towards finding a peace (or in the case of Germany, trying to use peace feelers as a way to split their enemies) are covered here. Part Three, Outcome, covers the Russian Revolution, the American entrance into the war, the final push of the Central Powers and the collapse of their armies, and their eventual ceasefire and surrender. The causes, progress, and results of the Russian Revolution, are perfectly blended into Stevenson’s coverage of World War I, and the same great amount of detail is put into it as the war itself. The reasons behind the American involvement in the war, from the various political reasons to the Zimmerman Telegram are covered, but once in the war, the actual fighting the Americans were involved with was very briefly stated, although their presence was ‘indispensable’ to the Allies’ victory. Also, the various tactical/operational improvements are discussed, especially prior to the Central Powers’ 1918 offensive, which met with early success but eventually drained the German manpower too much to allow them to continue the offensives, or even effectively defend themselves during the renewed Allied attacks. Also discussed is the role of Ludendorff’s mental breakdown in the eventual fall of Germany. The final part of the book is titled Legacy. Given the grand scope of the war, and its influence to later world history, it’s an apt title. A few different issues are discussed here. First, the Treaty of Versailles, reparations, and the League of Nations are all briefly discussed. The eventual bitterness towards the treaty certainly contributed to the rise of nationalist groups in Germany after the war, so you couldn’t talk about World War I without discussing them. Much of this section, however, is concerned with covering the breakdown of the cohesion of the Allied powers, their reasons for their laxity in enforcing the treaty, and indeed the eventual rise of the Third Reich (although Stevenson makes a point to show that the events of the 1930s and later were not inevitable, but they were more difficult to defuse because of earlier choices). One of the primary reasons mentioned for the breakdown of peace is the lack of American or Russian involvement in post-war security. I would recommend this book for anyone interested in World War I- unless you’re only interest is in the individual battles occurring during the war. Although the book covers the overall strategic decisions made by the powers fighting, comparatively little is written about individual battles. The Battle of Verdun gets about 3 pages of coverage, and some battles (for instance, the Second Battle of the Marne) get only passing mention. There are plenty of resources for readers interested in that. Cataclysm contains a 21 page bibliography- I’m almost certain you could find a perfect book for any topic you’d want listed in there. If you’re interested in the politics behind war, and the various processes a country has to undertake to keep a war running, as well as the strategy and flow of World War I, I don’t think you’ll find a better book than Cataclysm. My only warning is that this is NOT an easy read- it’s going to take you a month to get through this, but it’s well worth it. A chronicle of the choices and circumstances, as well as the resultant events, that enabled and then perpetuated the First World War. It avoids simplistic blame and lacks the revisionist tendencies of so many modern historians. Its focus on the political choices (influenced by economic and social situations on the homefront) is perhaps less exciting a read than the traditional battlefield strategic accounts, but it offers a very important sort of spiderweb of causality in its place. This is a high-level history of WWI, its focus on national strategy, though military strategy and tactical discussions come into the narrative. Its best at explaining, clearly, the top-level decisions by the combatant powers, their politicians and general staffs, and shows the course of the war in understandable terms. A good overview of a complicated war, and written in clear and succinct prose. Highly recommend. It is easy to understand why Cataclysm is used as the primary textbook for many classes on the First World War. In its one volume, it is absolutely jam packed with an immense amount of information covering all the angles that someone would want to look at the war from. There are viewpoints for each of the countries involved, what led up to the war, and how the war played out (year by year), and the resulting repercussions. It can certainly be used throughout an entire semester (I know from exper It is easy to understand why Cataclysm is used as the primary textbook for many classes on the First World War. In its one volume, it is absolutely jam packed with an immense amount of information covering all the angles that someone would want to look at the war from. There are viewpoints for each of the countries involved, what led up to the war, and how the war played out (year by year), and the resulting repercussions. It can certainly be used throughout an entire semester (I know from experience!). I found the book to be an extremely dense read – after just a few pages I felt tired from reading it and had to put it down; because of that it took me a lot longer to read. There was a lot of facts and numbers, to include armament counts, death tolls, etc. Honestly, I think every statistic that could possibly be given was included in this work. That is excellent if you have a detail driven interest in the war, but for an everyday reader if was intense. In terms of layout, it is fairly well done. Part 1 is the prelude to war, Part 2 looks at the various aspects of the war, Part 3 looks at the actual progression of the war to its conclusion, and Part 4 is the legacy of the war. Part 2 is the drier of the parts and is primarily where the extensive detail mine is. It is broken up into chapters such as “War Aims and Peace Negotiations”, “Technology, Logistics, and Tactics”, “Manpower and Morale” Part 3 is broken up by years and the general themes of who had the advantage. There are several maps located in the introduction of the book that I think would have been better placed within the appropriate chapters as quite frankly I forgot about referring back to them throughout the reading. When it comes to a discussion of war I find maps to be highly important and should be embraced with the discussion. I’m fine with the photographs being included in one section toward the middle of the book as they add more of a well-rounded overall experience, but are not absolutely necessary. Overall, this is an excellent presentation on the First World War, but it is not light reading by any means. Excellent work describing a very complex set of conditions that lead up to World War I. On top of that, the author is thorough in his description of the decisions which allowed the belligerents at war with each other. As you read this book, you get the feeling the war could have been stopped at almost any point along the way, but no one choose to do so. The most tragic part is end conditions, which Stevenson speaks about lead up to a more traumatic conflict just 20 years later. Overall, the book Excellent work describing a very complex set of conditions that lead up to World War I. On top of that, the author is thorough in his description of the decisions which allowed the belligerents at war with each other. As you read this book, you get the feeling the war could have been stopped at almost any point along the way, but no one choose to do so. The most tragic part is end conditions, which Stevenson speaks about lead up to a more traumatic conflict just 20 years later. Overall, the book was enjoyable and detailed. I could see this a college text book for a undergraduate history class. This book was used as a text in a course I'm taking on the Great War. It seemed daunting at first because of the subject and length, but it proved to be so well written, that I found myself reading ahead of class assignments. Mr. Stevenson leaves no stone unturned: military, diplomatic, political, social, economic. The sheer weight of facts is astounding, but what makes the book so interesting and readable is Mr. Stevenson's analysis of how those facts fit together. Exceptional history. There are probably other one-volume WWI histories that describe the military aspects of the war better than this. My aim in selecting this one were the economic and diplomatic explanations Stevenson presented, as well as a reconsideration of long-established tropes from other historians as well as poets and writers borne of the aftermath. Indeed, people knew what fire they were playing with and still went forth. Admirably extensive history of the First World War in a single volume, although its obsession with completeness means that finer details of many events get left out, leaving the reader with a blur of names and places and dates. Valuable reference material (particularly the more explicitly political sections, and the end pieces which show how the stage was set for the Second World War) but not light reading. Muy interesante, pero se me hizo un poco largo, tal vez porque llevaba otros libros en paralelo. Refleja con profusión muchos de los sucesos ocurridos durante la Gran Guerra, aunque yo esperaba algo más respecto a los entresijos de las negociaciones y comunicaciones realizadas entre los contendientes. A very comprehensive look at WWI. There are better books on the causes of the war, the strategy and tactics employed during the war, actions in specific theaters, the Peace Treaty, etc., but Stevenson does an excellent job of pulling all of the pieces together in one volume. There are a lot of interesting perceptions advanced and a good bit to disagree with. I struggled with this book. I'll be honest, you have to be really into it to finish this book. I've read a lot about WWI. Most of this wasn't new it was just a new perspective. The author is serious about it being a political history. Everyone else has rated this book highly so it might just be me but I found this really slow and couldn't finish it. I feel like I've summitted Everest after finishing this. It is as readable as an exhaustive, meticulously researched, extensively detailed account of one of history's great events can possibly be. I'm going to go on to something lighter now. A very compelling look at the decision making process that lead to WWI and how that process continued to lead to ruin for Old Europe. I recommend this book to people who really want a good overlook at the period, but you have to be really into the period. History of World War I that focuses on the economic and political aspects of that war. Set aside a month for this one. An excellent one-volume history of the Great War. The strength of this books is Stevenson's analysis of the causes and politics before, during, and after the war. The subject is interesting enough, of course, and the author is obviously knowledgeable, but the prose is turgid and flat. A great reference book, no doubt, but I could barely slog through.